380 Lottie Rocker Recliners Available in 3 Colors! Furnish SA, is a limited licensee of Horizon Merchant, Inc., owner of the trademarks, SofaBobs and FurnitureBobs. 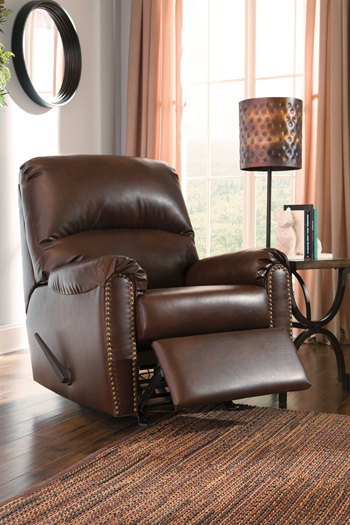 A streamlined approach to comfort, Lottie rocker recliner impresses with classic lines and elegant curves covered in high-performing DuraBlend®—for the look of leather without the maintenance or cost. Cushioned armrests help take the pressure off. Nailhead trim accents add cool character. Item Features: Frame constructions have been rigorously tested to simulate the home and transportation environments for improved durability. Corners are glued, blocked and stapled. Stripes and patterns are match cut. All fabrics are pre-approved for wearability and durability against AHFA standards. Cushion cores are constructed of low melt fiber wrapped over high quality foam. Features metal drop-in unitized seat box for strength and durability. All metal construction to the floor for strength and durability. The reclining mechanism features infinite positions for comfort. DuraBlend®/Match upholstery features DuraBlend® upholstery in the seating areas with skillfully matched Polyurethane everywhere else. Style also features panels with brads.